“There will be no ability to fight fire in these kinds of winds,” fire official. High winds topping 80 mph are feeding wildfire Thomas in southern California making it impossible to gain a foothold on the extremely dangerous fire. The powerful winds are not only fanning and worsening the existing fire but also causing new ones. Thousands more Ventura County residents were ordered to leave their homes as the uncontained Thomas fire reached beachfront communities, forced new evacuations overnight and continued to grow. Southern California officials are warning of unprecedented dangerous winds on Thursday, with gusts possibly reaching 80 mph. 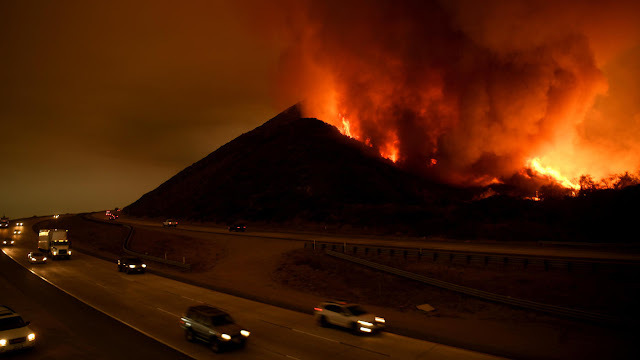 The region is dealing with several massive wildfires that have around 200,000 under evacuation orders As of 6 p.m., Wednesday the fire had scorched roughly 90,000 acres, according to Ventura County Fire Department spokesman Tom Kruschke. Wind gusts of 80 mph were recorded on Wednesday night according to LA Daily News. On top of the Thomas fire, another wildfire called the Skirball fire, broke out at 4:52 a.m. Wednesday, near the 405 Freeway and close to the Getty Center in Los Angeles. The blaze spread quickly, ordering mandatory evacuations of nearby homes and a full closure of the 405 Freeway in the area. Another named wildfire called the Creek fire was reported by the LA Daily News to have exploded in the foothills in the Sylmar area early Tuesday has now reached five percent containment Wednesday as weary firefighters braced for “extreme wind” overnight and conditions so ripe for fire one chief called them the worst he’d ever seen. In October, fires in the northern part of the state killed 43 people, about 10,000 buildings were destroyed or damaged by fire costing fire insurance losses nearly 10 billion dollars. Why have the FBI not caught these terrorists starting the fires?